“I have been completely drawn in and seduced by hot glass. I am fascinated by the endless possibilities this material has to offer. I love working with color and surface, gesture and form. Some of my major influences include William Morris, for his incredible surface treatments, Dale Chihuly, for his use of color, and traditional Japanese potters for their simple, almost primitive, but very elegant forms. I’ve been fascinated by all types of indigenous arts for years, especially Native American, African, and Pre-Columbian Art. All of these influences combine to help shape the statements that I wish to express. After twenty years in commercial construction, beginning in Vail and ending in Chicago, Peter Wright says, “I began to seek alternatives for the second half of my life.” In 1994, his life-long interest in art led him to found Wright Publishing Company. In this endeavor, Wright partners with artists to produce and market limited edition fine art; primarily bronze sculptures. The artists work in many media, including clay, wood, and stone, which Wright re-produces in bronze. 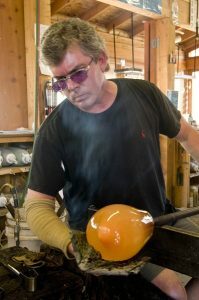 In 2000, renowned glass sculptor William Morris joined this group of artists and Wright was introduced to the world of art glass at the highest level. He spent countless hours watching hot glass being shaped into amazing forms. Ultimately, he realized that the best way to truly understand glass was to learn to work with it himself. He was “completely drawn in and seduced by hot glass” and that same year he began studying at Pilchuck Glass School in Washington.